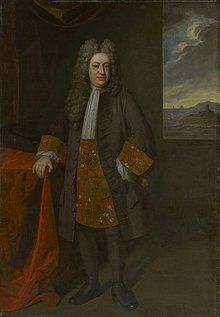 Elihu Yale (5 April 1649 – 8 July 1721) was a British merchant, slave trader, President of the East India Company settlement in Fort St. George, at Madras, and a benefactor of the Collegiate School in the Colony of Connecticut, which in 1718 was renamed Yale College in his honour. Born in Boston, Massachusetts, to David Yale (1613–1690) and Ursula, he was the grandson of Ann Lloyd (1591–1659), who after the death of her first husband, Thomas Yale (1587–1619) in Chester, Cheshire, England, married Governor Theophilus Eaton (1590–1658) of New Haven Colony. Yale's ancestry can be traced back to the family estate at Plas yn Iâl near the village of Llandegla, Denbighshire. The Yale family left Boston and returned to England when Elihu was three years old and he grew up going to school in London. For 20 years Yale served the Honourable East India Company. In 1684 he became the first president of Fort St. George, the company's post at Madras (now Chennai), India. He succeeded a number of agents from Andrew Cogan to William Gyfford. Yale was instrumental in the development of the Government General Hospital, housed at Fort St. George. Yale amassed a fortune while working for the company, largely through secret contracts with Madras merchants, against the East India Company's directive. By 1692, his repeated flouting of East India Company regulations and growing embarrassment at his illegal profiteering resulted in his being relieved of the post of governor. Yale returned to Britain in 1699. He spent the rest of his life at 'Plas Grono', a mansion bought by his father, or at his house in London, spending liberally the considerable wealth he had accumulated. Yale married Catherine Hynmers, a widow, in 1680. The wedding took place at St. Mary's Church, at Fort St. George, where Yale was a vestryman and treasurer. The marriage was the first registered at the church. Elihu Yale was re-appointed as president of the administration of Fort St George on 26 July 1687. He then implemented an order dated 14 January 1685 which required the English at Fort St George to make all attempts at procurement of the town of St Thome on lease. To this effect, Chinna Venkatadri was sent to negotiate with the local governor on 4 August 1687. The mission was successful and Chinna Venkatadri assumed sovereignty over St Thome for a period of three years. Notwithstanding the vehement protests of the Portuguese inhabitants of St Thome, the English gained absolute control over all lands up to St Thomas Mount for a period of three years. In September 1688, the Mughal Emperor Aurangazeb took Golconda after a prolonged battle. The Mughals took Sultan of Golconda prisoner and annexed the state. The newly designated Mughal Subedar of the province immediately sent a letter to the British authorities at Fort St George demanding that the English at Madras acknowledge the overlordship of the Mughal Emperor. The English complied willingly. Aurangazeb guaranteed the independence of Madras, but in return demanded that the English supply troops in the event of a war against the Marathas. It was around this time that Yale's three-year-old son David Yale died and was interred in the Madras cemetery. The records of this period mention a flourishing slave trade in Madras, a trade in which Yale participated and from which he profited. He enforced a law that at least ten slaves should be carried on every ship bound for Europe. In his capacity as judge he also on several occasions sentenced so-called "black criminals" to whipping and enslavement. When the demand began to increase rapidly, the English merchants even began to kidnap young children and deport them to distant parts of the world, very much against their will. At a time when profits from the slave trade were dwindling and pressure from the Mughal government to stop the enslavement was mounting, the administration of Fort St George eventually stepped in and introduced laws to curb enslavement. During Yale's presidency, a plan for setting up a corporation in Madras was conceived by Josiah Child, the President of the Board of Directors of the East India Company, in a letter addressed to the factors at Madras on 28 September 1687. Three months later, Josiah Child and his deputy had an audience with James II, and as per the ensuing discussions, a Charter was issued by the king on 30 December 1687 which established the Corporation of Madras. The charter came into effect on 29 September 1688, and a Corporation was established comprising a Mayor, 12 Aldermen, 60-100 Burgesses and sergeants. Nathaniel Higginson, who was then the second member of the Council of Fort St George took office as the Mayor of Madras. In August 1689, a French fleet appeared near the coast of Ceylon compelling the Governor of Pulicat Lawrence Pitt who was on high seas to seek protection within the bastions of Fort St George. Throughout the year 1690, French naval ships from Pondicherry ravaged the coast in order to drive the English and the Dutch out of the East Indies but were unsuccessful. They eventually withdrew from their enterprise when faced with heavy losses. It was also during this time that the English purchased the town of Tegnapatnam from the Marathas. As president of Fort St. George, Yale purchased territory for private purposes with East India Company funds, including a fort at Tevnapatam (now Cuddalore). Yale imposed high taxes for the maintenance of the colonial garrison and town, resulting in an unpopular regime and several revolts by Indians, brutally quelled by garrison soldiers. Yale was also notorious for arresting and trying Indians on his own private authority, including the hanging of a stable boy who had absconded with a Company horse. In Boston, Massachusetts, a tablet to Yale was erected in 1927 at Scollay Square, near the site of Yale's birth. Yale president Arthur Twining Hadley penned the inscription, which reads: "On Pemberton Hill, 255 Feet North of This Spot, Was Born on April Fifth 1649 Elihu Yale, Governor of Madras, Whose Permanent Memorial in His Native Land is the College That Bears His Name." In 1718, Cotton Mather contacted Yale and asked for his help. Mather represented a small institution of learning that had been founded in 1701 in New Haven, Connecticut, as the Collegiate School of Connecticut, which needed money for a new building. Yale sent Mather 417 books, a portrait of King George I, and nine bales of goods. These last were sold by the school for £800 pound sterling. In gratitude, officials named the new building Yale; eventually the entire institution became Yale College. Yale was also a vestryman and treasurer of St. Mary's Church at Fort St. George. On 6 October 1968, the 250th anniversary of the naming of Yale College for Elihu Yale, the classmates of Chester Bowles, then the American ambassador to India and a graduate of Yale (1924), donated money for lasting improvements to the church and erected a plaque to commemorate the occasion. In 1970 a portrait of him, Elihu Yale seated at table with the Second Duke of Devonshire and Lord James Cavendish was donated to the Yale Center for British Art from Chatsworth House. On 5 April 1999, Yale University recognized the 350th anniversary of Yale's birthday. An article that year in American Heritage magazine rated Elihu Yale the "most overrated philanthropist" in American history, arguing that the college that became Yale University was successful largely because of the generosity of a man named Jeremiah Dummer, but that the trustees of the school did not want it known by the name "Dummer College". In her article for The Atlantic about Skull and Bones, a secret society at Yale University, Alexandra Robbins alleges that Yale's headstone was stolen years ago from its proper setting in Wrexham. She further alleges that the tombstone is now displayed in a glass case in a room with purple walls. Elihu later became the name of a "senior society" founded in 1903 at Yale. Tom Wolfe, who earned a Ph.D. in American Studies from Yale, named the African-American Atlanta police chief in A Man in Full Elihu Yale. Yale College, a former college in Wrexham, Wales, which since merged with Coleg Cambria, was also named after Elihu Yale. Elihu Yale is the name given to a JD Wetherspoons pub in the town of Wrexham. Theodore Roosevelt's son Quentin kept a Hyacinth macaw named Eli Yale. A Yale University student or alumnus is known informally as either an Eli or a Yalie. ^ a b c "Elihu Yale (English merchant and philanthropist)". Encyclopædia Britannica. Retrieved 10 August 2009. English merchant, official of the British East India Company, and benefactor of Yale University. ^ a b "Yale, India, and the failure of the 'global university'". The Hindu. 4 May 2005. Retrieved 19 April 2008. ^ "Elihu Yale Was a Slave Trader". Digital Histories at Yale. Archived from the original on 8 November 2014. Retrieved 8 November 2014. ^ "Boston Erects Tablet in Honor of Elihu Yale". The Harvard Crimson. 25 January 1927. Retrieved 25 June 2011. ^ Gordon, John Steele (1999). "Philanthropist". American Heritage. 50 (3): 68. ISSN 0002-8738. ^ Robbins, Alexandra. "George W., Knight of Eulogia". The Atlantic. The Atlantic Monthly Group. Retrieved 14 June 2017. Wikimedia Commons has media related to Elihu Yale. "Yale, Elihu" . Dictionary of National Biography. 63. 1900. "Yale, Elihu" . Appletons' Cyclopædia of American Biography. 1889. "Yale, Elihu" . New International Encyclopedia. 1905.